Stephen S Holden does not work for, consult to, own shares in or receive funding from any company or organisation that would benefit from this article, and has no relevant affiliations. Science has a simple and incredible trick that will help you lose weight. The idea, it seems, is to make portions appear bigger because this leads people to serve and eat less. While many such fat-fighting claims are fake, this idea is that a fiction can have a real effect. We know that bigger portions lead us to eat more (bite-sized version here), but portions that appear bigger have a reverse effect. Visual illusions have long fascinated humans but mostly they are viewed as problems to be explained. Philosophers study them for the challenges they offer to the nature of being (ontology) and of knowledge (epistemology). Psychologists study them for the light they throw on our understanding of how the human brain works and its limitations. Consumer scientists such as Brian Wansink and Koert van Ittersum have been exploring how optical illusions can be used to help reduce consumption and tackle the growing prevalence of obesity. Using smaller plates is a fairly obvious solution to limit portion sizes. But there’s more to it than simply providing less space. Research shows that a portion served on a small plate will look bigger than it is, so people tend to under-serve on small plates and consume less. The use of bigger plates leads to the reverse effect – the portion looks smaller than it is. 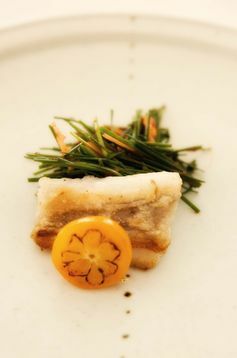 This may underlie the common criticisms of nouvelle cuisine as providing “tiny portions” that are more art form than food. The illusory effect of plate size on portion size is explained by theDelboeuf illusion, and the related Ebbinghaus illusion. 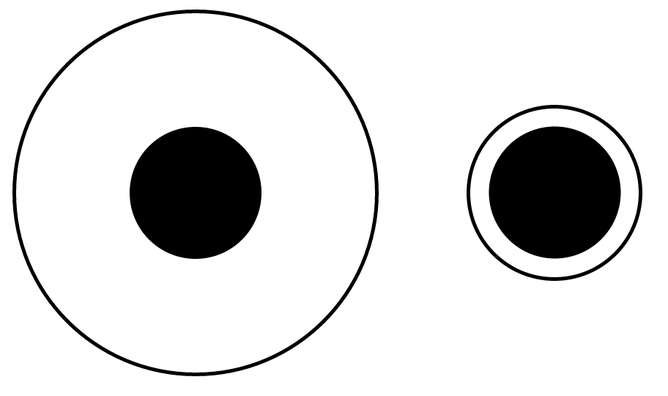 The Delboeuf and Ebbinghaus illusions are thought to critically depend on the contrast in size between the target (the circle in the centre) and the surrounding context. A portion of food appears smaller when served on a bigger plate, encouraging us to over-serve. But the size contrast is complicated by the issue of colour contrast. The tendency to over-serve on big plates is amplified when there’s not much of a contrast in the colour of the food and the plate, such as pasta with a creamy sauce served on a white plate. Over-serving on bigger plates is also more likely if there’s high contrast between the plate colour and the tablecloth colour. So, if you are using large plates, choose plates of a colour different from the food and similar to the tablecloth. You can also use these illusions with beverages. If you want to reduce your intake of sweetened drinks or alcohol, for instance, use tall, thin glasses in place of short, wide glasses. People drink less from a tall, thin glass than a short, wide glass with the same volume. 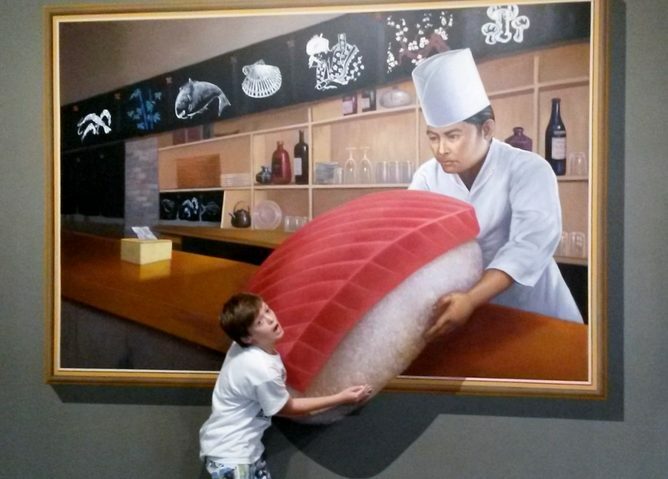 This effect is displayed by adults and is even stronger among children. It also holds for pouring drinks – even after training, and even among experienced bar-tenders. Indeed, this illusion is so persuasive that many people are surprised to find the volume of large sizes is often little different from the next size down. Sports fans in the United States recently revealed how a Seattle stadium and an Idaho stadium have sold small and large cups of beer holding roughly the same volume, even though the larger one costs more. Similar claims have been made about more mainstream food retailers such as McDonald’s and the Canadian coffee shop chain, Tim Hortons. Hortons has responded with its own clip showing there is a difference. McDonald’s medium and large cups hold the same volume. The reason that the illusion works is not clear although it may be related to orientation anisotropy, the well-known tendency to perceive a vertical line as longer than an equivalent horizontal line. 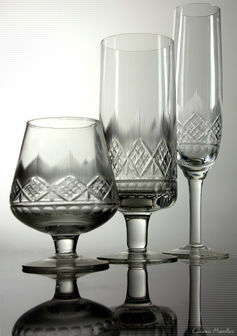 use tall, thin glasses, such as wine-tasting glasses. To use the over-serve bias to encourage more consumption of healthy foods, use big green plates for vegetables and short, wide glasses for water. Many claims about reducing consumption and losing weight hold little truth, but the illusions described here present little fictions that might actually help.